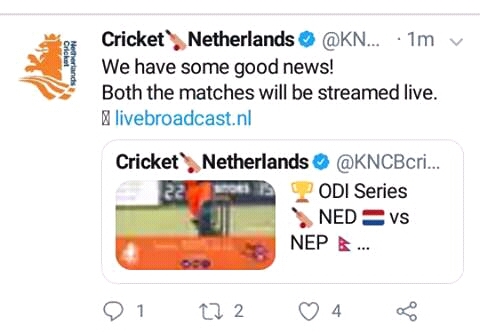 Cricket Netherlands to broadcast Nepal vs Netherlands both ODIs. Cricket Netherlands confirmed that they will broadcast historical ODI Series. Two-matches series will commence on 1st August with second match on 3rd August. Cricket Netherlands Confiremd Through Their Official Twitter Handle. Both matches will take place on VRA Cricket Ground, Amstelveen. Nepal cricket team, which earned ODI status during this year’s World Cup qualifiers, will play their first ever ODI match against Netherlands. Nepal cricket team is currently in UK, all set for T20 triangular series, with completion of 4 practice matches. The two teams will also play a T20 tri-series with the Marylebone Cricket Club (MCC) at Lords, which will start from July 29.